Yamaroku Soy Sauce Co., Ltd. In all of Japan, there are only 3,000 to 4,000 traditional cedar vats still in use in the soy sauce, miso, vinegar, mirin and sake industries. Of those, 1,000 are in Shodoshima. 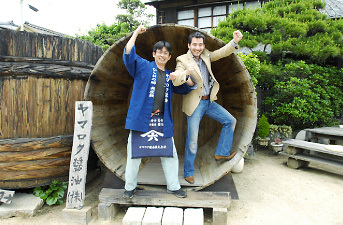 At Yamaroku, we have 40 large and 17 medium wooden vats, for a total of 57. That makes us close to the tenth largest owner of wooden vats in the soy sauce industry. The cedar vats are about 2 meters tall but you can climb up the stairs and look down at the moromi inside. Mr. Yamamoto checks the moromi frequently and stirs it to accelerate fermentation whenever necessary. Hishio no Sato is a fascinating area on the east side of the island where the streets are lined with century-old soy sauce warehouses and tsukudani factories. One of these is the Yamaroku Soy Sauce warehouse built about 150 years ago. Yasuo Yamamoto, the fifth generation president of this family business, met me and took me inside. 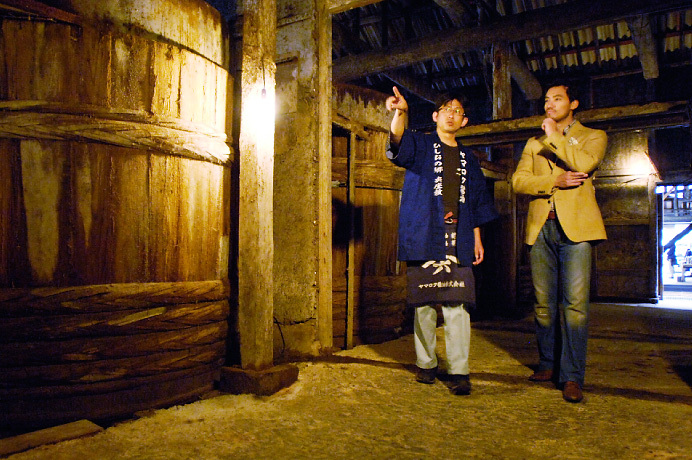 “We make soy sauce in these cedar vats,” he said, pointing up at them. In those? I wondered in surprise. “I was expecting something more modern,” I blurted out. Cedar vats produce Yamaroku’s distinctive flavor but the fact that they have only one such warehouse left is a cause for concern. “I’m going to take training next year so that I can maintain the wooden vats myself,” Mr. Yamamoto confided. 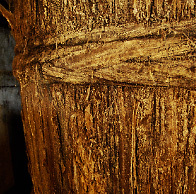 The cedar vats look as though they’re rotting but in fact they are coated in lactobacillus, yeast and other bacteria essential for soy sauce brewing. In some places, this bacterial crust is close to 8 cm thick. At the top of the stairs, you can look down at the moromi in the vats. The smell during fermentation can make you light-headed. “Be careful not to slip and fall in,” Mr. Yamamoto warns me. In the quiet warehouse I can hear something pop-popping. It’s the sound of the moromi fermenting. 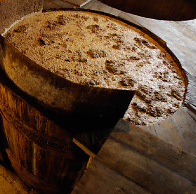 Peak fermentation is from June to July. I see something resembling white mold clinging to the cedar vats. It’s all over the posts, beams and earthen walls, too. I bend close and sniff. It smells sweet and sour, a bit like cheese. “Ah, you’ve got a good nose,” Mr. Yamamoto remarks. “That’s the smell of the bacteria that live here. It’s not us who make the soy sauce. It’s the bacteria living in this warehouse that encourage fermentation. They are over a hundred types!” Let me get this straight. Bacteria bred for the last 150 years are making the soy sauce. Hmm. Japanese seasonings are really deep! 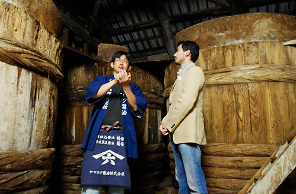 In 2009, Yamaroku took out a loan and built 12 cedar vats, the first new additions to this warehouse since the end of the Second World War. “It’s thanks to my grandfather and great-grandfather that we can still make soy sauce today. They made wooden vats and protected and passed on the bacteria. My mission is to pass the vats and the bacteria on again to my children, grandchildren and great-grandchildren.” Protecting tradition. It may sound simple but it requires strong belief and passion. There was both courage and conviction in Mr. Yamamoto’s friendly smile. 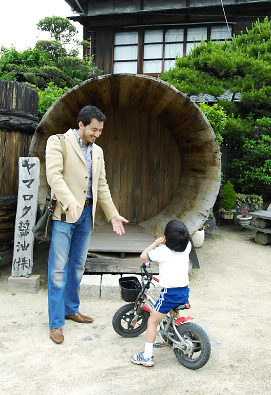 “Hi!” Mr. Yamamoto’s son comes racing over. “Are you going to make soy sauce, too, when you grow up?” I ask. 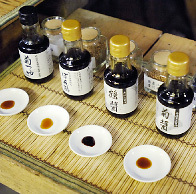 Yamaroku makes two kinds of soy sauce: Kikubishio, a standard dark soy sauce, and Tsurubishio, a twice-brewed soy sauce. In addition, the factory produces Kiku-tsuyu, dark soy sauce combined with soup stock, and Ponzu, dark soy sauce flavored with the juice of Japanese citrus fruits. Kikubishio soy sauce is made from sweet-flavored black soybeans from Tanba in Kyoto. Tsurubishio is made with round domestically grown soybeans. The production process for twice-brewed Tsurubishio is rather extravagant. 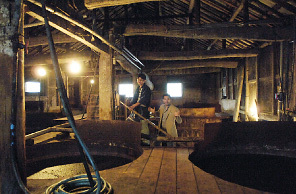 Soy sauce that has been matured for about two years is returned to the wooden vat and fermented once again with soy sauce instead of salt water. 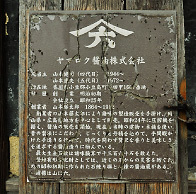 The wooden single-storied soy sauce warehouse has been designated as a tangible cultural property. A charming structure built in the mid-nineteenth century, it is representative of the Hishio no Sato area. Yamaroku makes only two kinds of soy sauce. One is a dark soy sauce called Kikubishio. It has a unique, refreshing flavor and savoriness. The other type is Tsurubishio, a very dark, rich soy sauce with a pleasantly savory aftertaste. In general, the savory component, known as umami in Japanese, is about 1.5 but with Tsurubishio it’s 2.3 to 2.5! I bet it’s a perfect seasoning for simple dishes and would be great added as a pinch of extra flavoring in more complex cuisine. According to Mr. Yamamoto, when poured over vanilla ice cream it’s like caramel sauce. Mmm. I’ll have to try that. Yamaroku uses only the best ingredients and allows the soy sauce to mature for one to three years. I asked why they spend so much time and effort when they surely can’t make much profit. “Because no one can duplicate the flavor of the soy sauce we make in our cedar vats,” Mr. Yamamoto said. 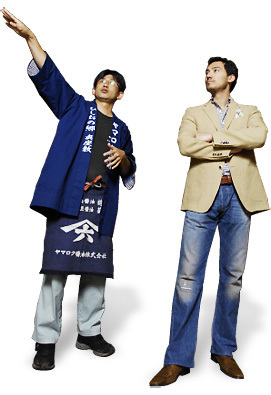 “We take pride in being two steps ahead of other companies and we aim to keep making products that are superior to the rest.” The fact that Yamaroku fans are rapidly increasing all over Japan proves that he’s right. And today, they gained another fan ? me! Characteristics: Twice-brewed soy sauce that results in a perfect rich and mellow flavor. 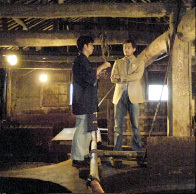 The second brewing uses the milder saltiness of ki-joyu (unpasteurized soy sauce) instead of salt. This is what gives it a mellow flavor. Copyright (C) 2011 Shimashow. All Rights Reserved.